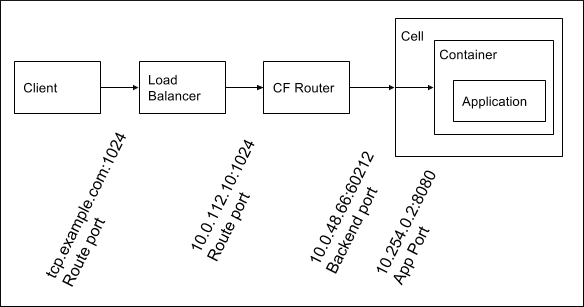 By default, the Diego Cell only routes requests to port 8080, the App Port, on the container internal interface. The App Port is the port on which applications must listen. Developers can use the Cloud Controller API to update the ports an app can receive requests on. For more information, see Configuring Apps to Listen on Custom Ports (Beta). Note: If you have mutual TLS between Gorouter and app containers, app containers accept incoming communication only from the Gorouter. This disables TCP routing. (Optional) Choose IP addresses for the TCP routers and configure your load balancer to forward requests for the domain you chose in the step above to these addresses. Skip this step if you have configured DNS to resolve the TCP domain name to an instance of the TCP Router. Configure these IPs as your static IPs in your deployment manifest. Configure the routing_api.router_groups manifest property with the same range of ports that you configured your load balancer with in step three, above. See the CF Routing Release Github page for more information. To modify the ports after you have deployed, see the Post-Deployment steps: Modify your TCP Ports topic below.